K's Kraftology: Yummy for your tummy! Hi gang! 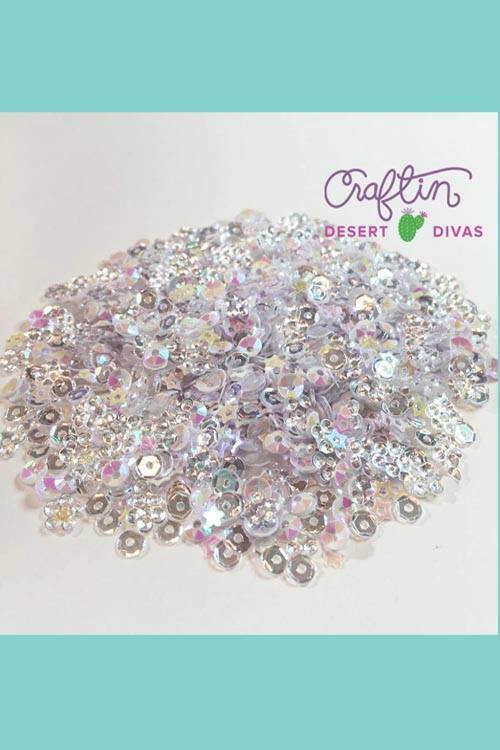 I'm back with another Design Team project for Craftin Desert Divas Digi team! Sometimes it's so very hard to choose which image I want to use. My wishlist is huge! 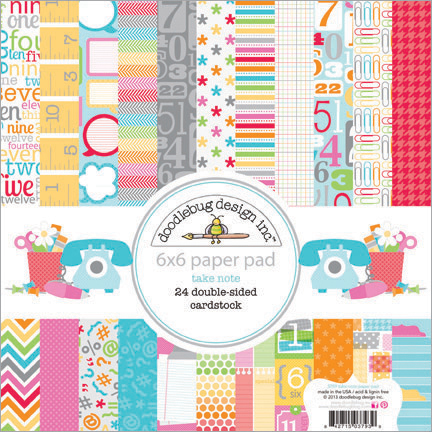 I thank Tara at CDD for offering such a wide variety of digi stamps to choose from and they keep on coming! Today I wanted to give a go at watercoloring using my Zig Real Brush markers and a water brush. 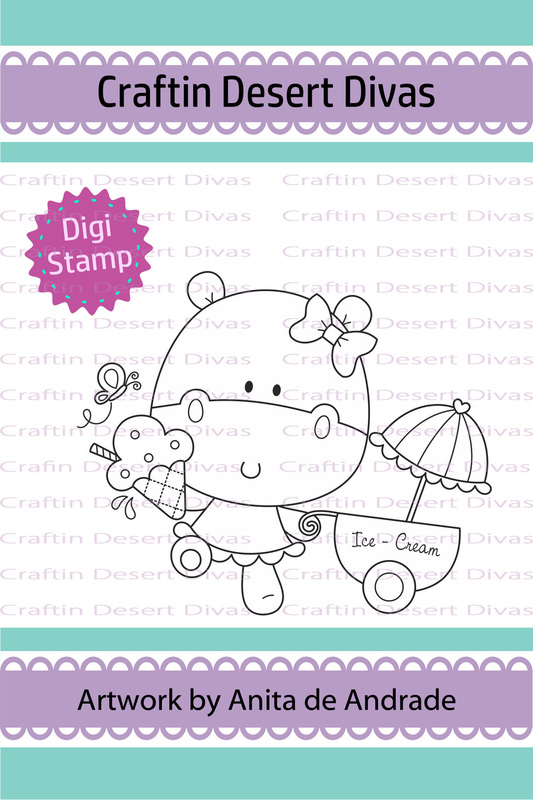 I chose this awesome hippo holding one of my favorite things...ice cream! Especially on these hot summer days. I printed out my image using my laser printer. I simply cut down the watercolor paper to 8 1/2 x 11 and used the bypass tray. Worked like a charm! 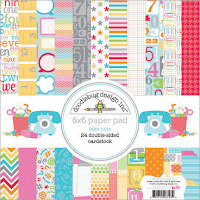 I picked out several bright colors because summer just seems to need bright colors! I find for me, I have better luck using a water brush with the Zigs on watercolor paper. I feel like I have better control than when using a regular brush. You just have to be careful that you don't reactive another color if you are working right next to it! I stamped the sentiment on one of the tag stamps using watercolor paper. I then hand trimmed it and sponged it with Squeezed Lemonade and Twisted Citron. I flicked some water on and blotted off with a paper towel to add some more texture. 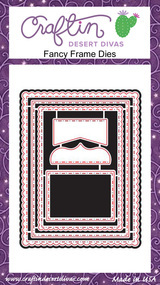 I cut the main panel out using the largest die from Fancy Frames (love this set!). I adhered it to a pink layer then used foam adhesive to attach it to the printed background. Then all of that onto a white card base. 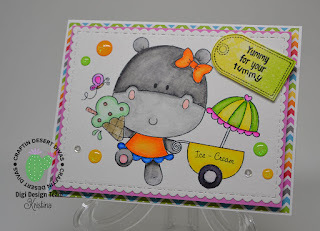 And since I have a total addiction to Doodlebug Sprinkles, I added a few from the Summer Glitter set. I also snuck in some small, clear sequins from the Fairy Dust sequins. Hope you give watercoloring a try!